I find blogging a wonderful exercise in gathering & focusing your thoughts, and allowing you to nurture an idea from premonition to full-fledge argument. As a product of the business school system, I feel dangerously inadequate if I put forth a premise without proper research supporting my assumptions. To that end, blogging has become a way for me to feed the research monster within me that was awaken and never fully satisfied through 20 years of school. Through blogging, I have widened my sphere of knowledge and expertise, hopefully making me a more value-added person. Maintaining a blog is like having a ticking countdown clock for your next intelligent idea. Part of my mind is always searching for the next potential blog topic. I keep e-Post-it Notes on my computer and on my iPhone so I can immediate record my thoughts when inspiration strikes. A blog beckons me to continually ask questions and be critical of myself and the world around me, and that is a good practice to have whether you write a blog or not. My father never forgets to remind me one lesson he learned from his greatest teachers: “In the end, people will know you from are the books you’ve read, the pictures you’ve taken, and the diary that you keep.” To that end, my library grows each year, whether in paper or electronic form, and my photo albums continue to amass with the help of iPhoto and photo tagging through the various social networks. Keeping a diary I found, also needed to transition in the information age. While my blog is not a place where I write my most personal thoughts and secrets, I feel it is a chronicle of my thoughts and opinions from a certain place & time. I look forward in the years to come, to read through my past blog posts and re-evaluate my own thoughts and perspectives. I believe it will be essential in my personal critique and growth into the leader and man that I aspire to be. A public blog like genYchina still leaves room for a personal private diary that keeps more intimate thoughts. I still keep mine in paper form. But I have been contemplating moving my personal private diary online onto a secure, password-enabled private blog. While I know many would advise against such moves because of the fear of hackers and information leaks, I am more concerned with the risk of losing my private diary to an accident. 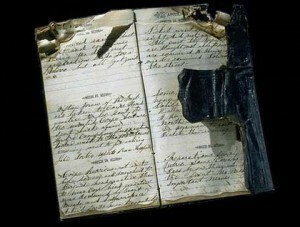 Keeping a paper diary is highly at risk of being lost in a fire, flood, misplaced, or moths & termites. Even keeping a diary on your personal computer’s hard drive, or an external drive, or burned onto a CD are all still at risk to fires, floods, being stolen, or digital degrade. Storing information on the Internet offers infinitely greater redundancies, and you can still keep a copy on your own personal hard drive. As my career progresses and I find myself pursuing more specialized and strategic positions, I have found that keeping a blog has become a major benefit to the job-hunting process. A blog is not necessary for all industries and positions, but for those in the creative industries, where what you have done before is not as important as what new things you can do for a company in the future, a simple CV and cover letter will not suffice. Smart recruiters (and smart companies) will take the time to read an applicant’s blog to get a deeper sense of how this person’s mind works, and what kind of lenses they use to analyze an issue. It is also a signal to applicants if a company doesn’t take the time or care to read their blog. What does not reading an applicants blog say about the company’s culture and focus when it comes to human resources? A blog is to a strategic manager as a portfolio is to a creative. In my personal experiences, those companies who have read my blog before I walk in to the interview ultimately have infinitely more questions and a deeper fascination with my interests. It makes the interview all the more vibrant, interesting, and pleasurable for both parties. It also gives each side a much clearer sense if working together would be a good fit. In my own hiring practices I will take the time to read applicant blogs where blogs are available, and I must admit reading blogs does highly influence my decision-making behaviour. In our faster, more networked world, with LinkedIn and Facebook serving as instant access to all our basic career and educational information, it is our blogs that will grow in eminence as an essential component of our job prospecting. Many people say blogs are being taken over by Twitter, or that blog conversations are changing as a consequence of people moving over to Twitter. While I will agree to the latter observation, I do not think that Twitter is the end of blogs. Just like how newspapers are different than magazines, so too is Twitter ultimately a different creature, and serves different purposes than blogs. The fact that you can retweet links I believe has increased the traffic and cross-blog activity. Blogs will continue to be the place for longer-form personal exposition. In the end, writing genYchina is first and foremost for me. Even if I was my blog’s only audience, that would be perfectly fine, but I am evermore grateful that I have the chance to share my thoughts and ideas with other like-minded people as yourself. So thank you for spending part of your precious time reading these thoughts. I hope you will continue to return and share with me your comments.